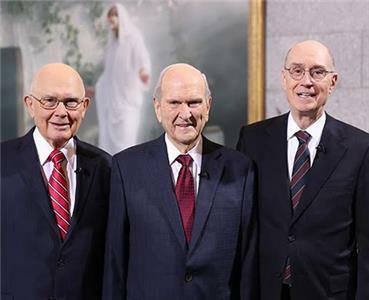 From left, ?Dallin H. Oaks, Russell M. Nelson, and Henry B. Eyring? President Russell M. Nelson of the Quorum of the Twelve Apostles has been called as the 17th President of The Church of Jesus Christ of Latter-day Saints. He succeeds President Thomas S. Monson who passed away on Jan. 2, 2018. When the president of the Church passes away, succession in The Church of Jesus Christ of Latter-day Saints happens “in an orderly way that – remarkably in today’s world – avoids any trace of internal lobbying for position or rank. Viewed by members as a divinely revealed process, it is devoid of electioneering whether behind the scenes or in public." Following the passing of the president, the First Presidency is dissolved and “the Quorum of the Twelve unanimously selects the new president of the Church. The new president chooses two counselors and the three of them become the new First Presidency. Throughout the history of the Church, the longest-serving apostle has always become the president of the Church when the First Presidency has been reorganized." The First Presidency is the highest-ranking governing body in The Church of Jesus Christ of Latter-day Saints. The First Presidency “supervises the work of the entire Church in all matters of policy, organization and administration.” The Quorum of the Twelve Apostles is the second-highest presiding body in The Church of Jesus Christ of Latter-day Saints. “Apostles serve under the direction of the First Presidency and have heavy administrative responsibilities to oversee the orderly progress and development of the Church throughout the world." As the longest-serving Apostle, President Nelson has been leading the Quorum of the Twelve Apostles. As of Jan. 14, 2018, he was ordained as the President of The Church of Jesus Christ of Latter-day Saints. He is also the Lord’s prophet for the world. The announcement was made public on Jan. 16, 2018 – first to the more than 16 million Mormons across the world – and then at a press conference that included national and international press. Elder Dallin H. Oaks and Elder Henry B. Eyring of the Quorum of the Twelve were called to serve with President Nelson as first and second counselors in the First Presidency. Prior to his service as an Apostle of The Lord in 1984, President Russell M. Nelson was a world-renowned heart surgeon. He speaks Russian, Mandarin and Spanish. President Oaks is the former president of Brigham Young University. He served as a Utah Supreme Court justice from 1980 until 1984 when he was called into the Quorum of the Twelve Apostles. President Henry B. Eyring was formerly president of Ricks College in Rexburg Idaho from 1971 to 1977, and was a faculty member at the Graduate School of Business at Stanford University from 1962 to 1972. He was sustained as a member of the Quorum of the Twelve Apostles in 1995 and served as a counselor to the late President Thomas S. Monson. President Nelson stated that he had served under five previous presidents of the Church. He said that the Lord always has and always will instruct and inspire His prophets. “The Lord is at the helm,” President Nelson said. “We who have been ordained to bear witness of His Holy name throughout the world will seek to continue to know and follow His will.” President Nelson then called upon Church members to keep on the covenant path – to follow the Savior and keep His commandments. He invited those who had stepped off the path to please come back because our Father in Heaven cherishes each of His children and wants all to return to Him. In a follow-up press conference, President Nelson expressed optimism about the future and gave his assurance that everyone – no matter their circumstances – can face the future with optimism and joy “if you have faith in the Lord Jesus Christ and His gospel…. We wish for people everywhere to hear the positive message of the restored gospel of Jesus Christ because we declare it has the answers to the most compelling answers and complicated challenges facing us today,” he said. Asked by the press about Church views on the LGBT community, President Nelson and his counselors emphasized that God loves His children and that He wants them to have joy – and that His Church has a responsibility to teach love and to teach the commandments of God, to teach about the love of the Lord and the law of the Lord – and how God has a plan for all of His children to reach the highest destination He has prescribed for them. When asked about age and nationality of Church leadership, President Nelson pointed out that there are thousands and thousands of local leaders throughout the world from diverse backgrounds and many countries that hold leadership positions in The Church of Jesus Christ of Latter-day Saints. The Quorum of the Seventy is also a diverse body. Regarding the Quorum of the Twelve Apostles and the First Presidency, he noted that they are called of God – these men did not seek their positions – and man’s ways are not God’s ways. When asked about women, President Nelson and his counselors noted the role of women in Church leadership and expressed gratitude for the influence of their wives, daughters and mothers. President Nelson also referred the press to his General Conference address in which he spoke about the need for women to step forward and take their “rightful and needful place in your home, in your community, and in the kingdom of God – more than you ever have before.” “It would be impossible,” he said, “to measure the influence women have, not only on families, but also on the Lord’s Church, as wives, mothers, and grandmothers; as sisters and aunts; as teachers and leaders; and especially as exemplars and devout defenders of the faith,” (Nelson, A Plea to My Sisters, October 2015). “My dear sisters, you who are our vital associates during this winding-up scene…we, your brethren, need your strength, your conversion, your conviction, your ability to lead, your wisdom, and your voices. The kingdom of God is not and cannot be complete without women who make sacred covenants and then keep them, women who can speak with the power and authority of God…. Together,” he said, “we will help prepare the world for the Second Coming of the Lord.” Simply put, President Nelson’s views about women are a matter of public record. And the Relief Society, or women’s auxiliary of The Church of Jesus Christ of Latter-day Saints, continues to stand as one of the oldest and largest women’s organizations in the world. For members of The Church of Jesus Christ of Latter-day Saints, including those in the greater Chattanooga area, the First Presidency message and press conference of January 16, 2018 were historic moments. When the press asked a final question about Church transparency, the First Presidency responded in a clear and concise manner, reminding the the press that the Church is publishing the Joseph Smith papers – making its entire history available to the public. “How would you like somebody to go through all your papers,” President Nelson asked, “everything you’ve ever done, everything you’ve ever written and have it dissected one hundred years later by people who didn’t know the context? The prophet Joseph Smith comes out mighty high, mighty strong. The longer I live, the more I appreciate the remarkable accomplishments of that prophet of this dispensation,” President Nelson stated – meaning that The Book of Mormon remains what Joseph Smith said it was – another testament of Jesus Christ. And, that the doctrine of Christ revealed to His prophets is true – including the words spoken by President Russell M. Nelson, the new prophet introduced to the world.